On this date in 1687, the Austrian empire made the first of its many Protestant martyrs in Eperjes — the Hungarian name for the city now in Slovakia, where it is known as Prešov. In the wake of the unsuccessful Zrinski-Frankopan Hungarian conspiracy against Hapsburg absolutism, the arch-Catholic Holy Roman Emperor Leopold did some cracking down. Thokoly enjoyed fantastic success, carving by force of arms a Principality of Upper Hungary roughly corresponding to present-day Slovakia. Squeezed as he was between the great powers of the Holy Roman Empire and the Ottoman Turks, Thokoly allied himself with Sultan Mehmed IV and aided the Turks’ 1683 siege of Vienna. That meant that his followers would share the downfall of that enterprise. 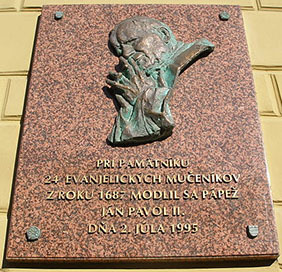 Pope John Paul II and Evangelical bishop Jan Midriak prayed together at a monument to the Presov martyrs in 1995. (cc) image from Jozef Kotulic. For Presov and those misfortunate enough to be caught there, matters were worse. The Hapsburg military governor of the former rebel territory, Antonio Caraffa, set up a star chamber to deliver some harsh justice. From February 1687, Presov Protestants trying to raise money to re-establish war-damaged schools were accused of conspiring to rise again and subjected to a series of torture-driven show trials. 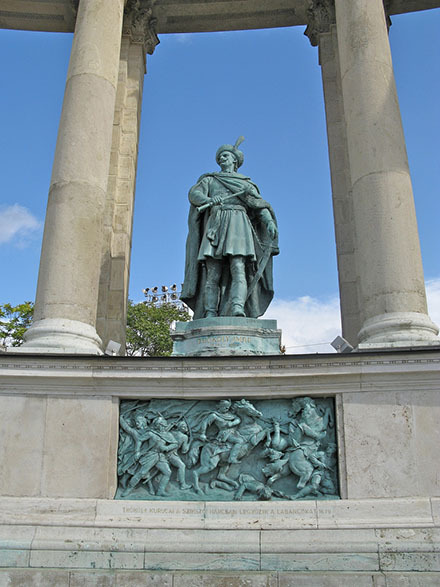 Statue of Imre Thokoly at Budapest’s Heroes’ Square. (cc) image from Hungarian Snow.